Gold, silver, and mining stocks moved higher once again yesterday and the former even managed to move above the declining trend channel. 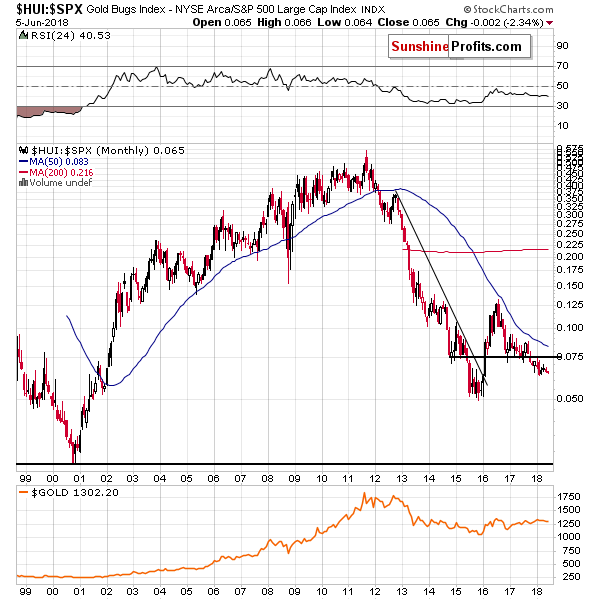 Breakouts are bullish and thus the outlook for gold improved significantly… Or did it? Gold’s price in terms of the euro and gold’s relative performance to silver and mining stocks make replying to the above question quite easy. Looking at the relative price moves on a day-to-date basis doesn’t provide any interesting implications, but who says that it’s the only way in which one can examine them? Let’s move right into the charts, starting with the gold chart. Yesterday’s upswing, as encouraging as it may have appeared, was nothing extraordinary. Yes, the price of gold moved above the upper border of the declining trend channel, but the same was the case just several days ago and the breakout was invalidated shortly as gold moved back below $1,290 shortly. Breakouts need to be confirmed, before they can be viewed as important. 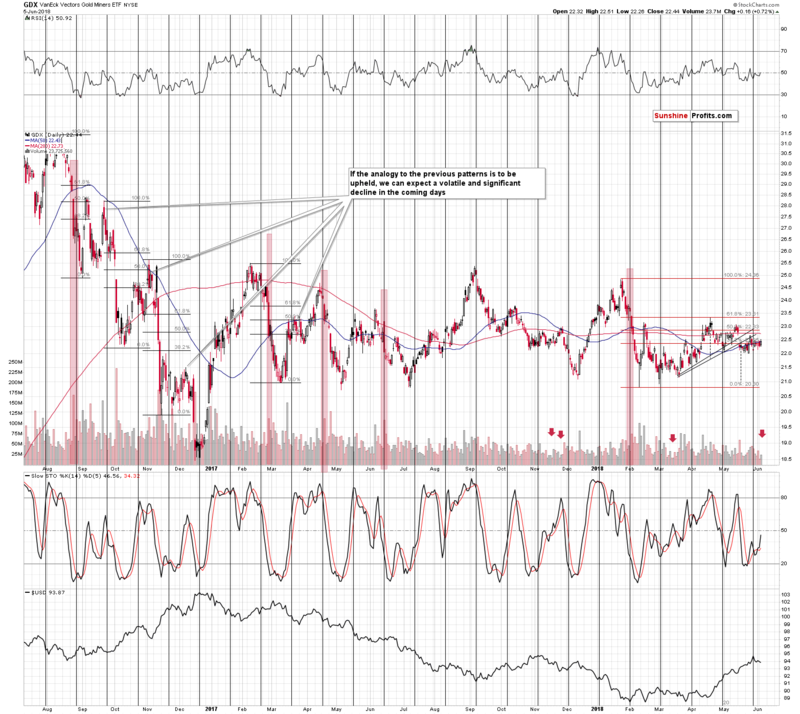 If they are not, and are invalidated instead, they become bearish signs. We have just seen an example of this phenomenon in the gold market, and this should make us particularly suspicious to another attempt of gold to move above the declining resistance. 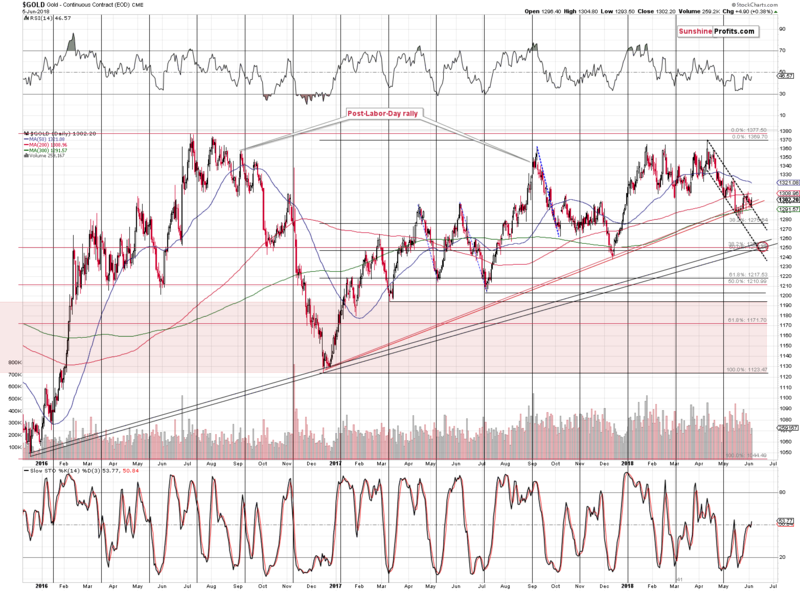 This is especially the case since gold moved higher on low volume. Yesterday’s breakout did not represent a fierce battle between bears and bulls that was won by the latter. It was more of a pause during which both sides were hesitating. Consequently, there are no bullish implications of yesterday’s upswing in gold. This is especially the case if we consider the situation in gold in terms of the euro. The RSI indicator based on this version of gold’s price has recently indicated a local top by moving above 70 and then back below it. With the exception of early 2016, this signal meant that a bigger decline was starting. We saw a small move higher since this signal became visible, but it’s not close to the sizes of the declines that we saw in analogous cases. 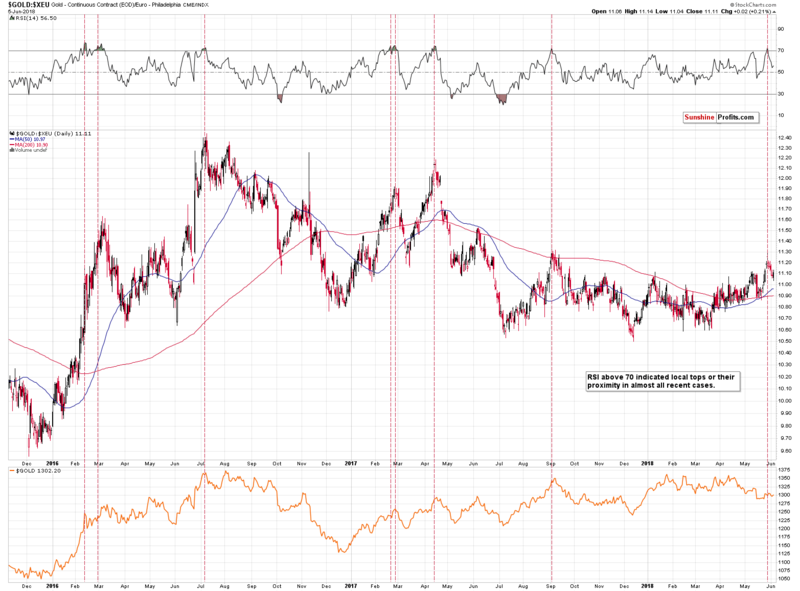 Consequently, if history is to rhyme, we could expect gold to fall further in the short run. The size of the silver rally doesn’t seem significant at first sight, but the size of the volume in silver suggests that we may have seen something important. It’s not spectacular, but it is big if we compare it to the size of the volume in gold. The yellow metal moved higher on low volume, but what we see above is rather average. Could it be the case that the silver price action is somehow meaningful in relation to gold? On a day-to-date basis, it may not appear significant, but if we consider the last 5 trading days, we’ll see that gold is lower than it was, gold stocks are lower than there were and that they underperformed gold, whereas silver is more or less where it was before. This means that silver has indeed outperformed gold, while gold stocks underperformed. The signal is not as clear as if we had seen this kind of outperformance and underperformance on a single day, but it’s definitely meaningful. 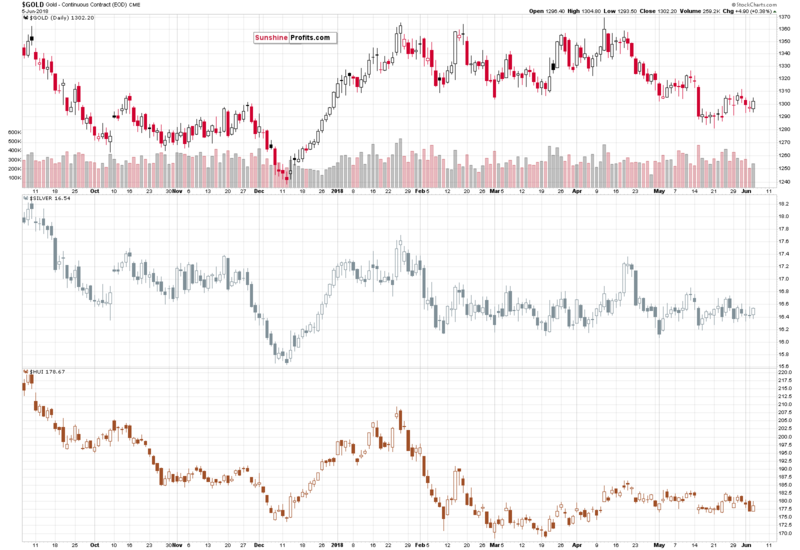 As a reminder, silver’s outperformance and mining stocks’ underperformance is one of the gold and silver trading techniques that provides bearish signals right before declines. This brings us to the analysis of mining stocks. After each short-term downswing that was particularly volatile, GDX moved back up a few times before the decline continued. The early 2018 decline was definitely very volatile, so we shouldn’t be surprised to see this kind of consolidation. It’s longer than the previous ones, but in terms of the prices that were reached, the 2016 price moves and the 2018 ones seem quite similar. The implication here is that once mining stocks break below their previous 2018 low, the following slide is likely to be volatile, just like the declines in 2016 were. In the light of the above, one might expect GDX to reach its late 2016 lows after such breakdown. All in all, the short-term outlook for the precious metals mining stocks is bearish and it seems that it may become even more bearish later this month, after GDX breaks to the new 2018 lows. As far as the big picture is concerned, the key thing to keep in mind about mining stocks is that they are after two major breakouts with regard to their performance vs. gold and vs. other stocks. 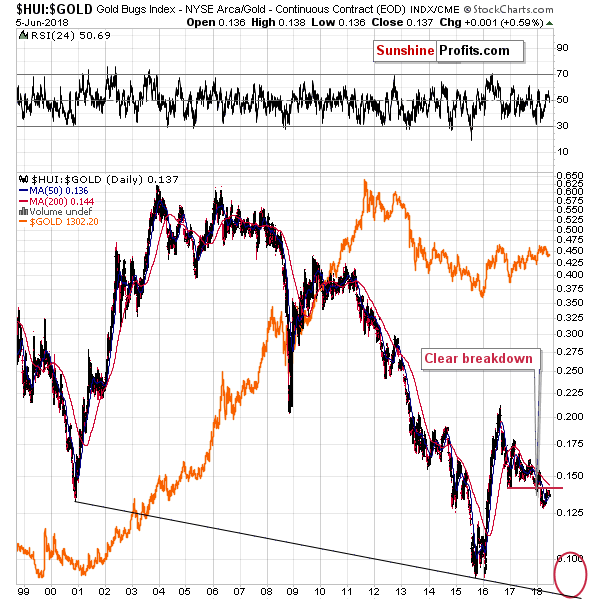 As you can see on the above charts, both key gold stock ratios are after major, long-term breakdowns. Both moves were also confirmed, which means that they were not accidental, and the implications should be considered important. The moves were not only confirmed in terms of time and by a move back to the previously broken level (in the case of the HUI to gold ratio on the upper chart) – the moves actually confirm each other. If it was just one of the ratios providing this kind of signals, its strength would be limited, but since both of them point to the same – bearish – outlook, it’s something that one needs to keep in mind. Summing up, while the precious metals market is boring on a day-to-day basis and nothing seems to be going on, if we consider a slightly broader timeframe, we see that the signals are pointing to lower prices in the coming weeks, which is in tune with the current True Seasonal patterns. Moreover, let’s keep in mind that the analogies to what happened in gold and silver when the market was just as boring as it’s been recently suggest that if we get another very short-term and small move higher, it may be the final one before the move to the final bottom begins. 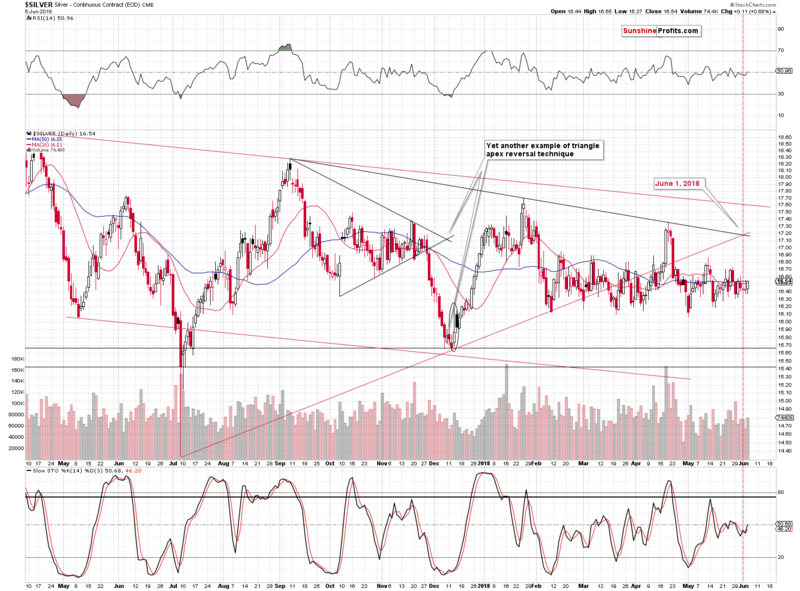 The outlook for the precious metals sector remains bearish.